If you're looking for some refreshment for your promotional marketing plan, then add your custom imprint to this 16 oz. travel mug. 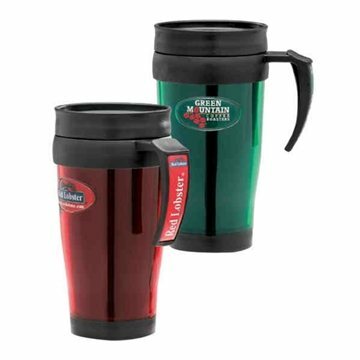 With double walled insulation, opaque body, black plastic trim and lining, this beverage container is ideal for both hot and cold drinks. It also features a twist top lid and spill proof sliding sip. Please be advised that it is NOT recommended for dishwasher or microwave use. Ideal for home, office and commuting. You all did a great job getting my order in and working with me on price I like the way the colors turned out. We purchased these for our conference. Everyone seemed to like them. it was a very inexpensive product which was ideal for a free give a way. Shipped fast and well packed. grace was AnyPromo. because of it, my customer satisfaction is excellent. Not a comment regarding the product, but just to say that Rosa, the sales person who assisted me did a great job. Great quality for a great price.